Ahhh, this chapter was so satisfying. Thanks for the release! 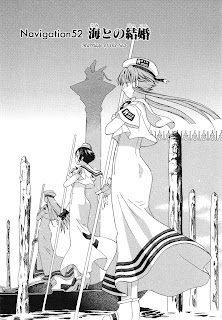 Despite the beautiful drawn sceneries, I also find this one of Amano's lesser chapters. I prefer it when she keeps things a bit more small and intimate. And I still can't get over Akatsuki's creepiness.. The translation is, as usual, excellent! Good job! awesome awesome awesome awesome awesome awesome chapter!!! Inthernet: Festa Della Sensa (Ascension Day) is still one of the least touristy holidays for venetians, which they like much. i check the site every day in hopes for a new chapter. it brightens my week to find one here. thanks! But, well... it was meh because, you know... far from the manga. Thanks for the translation Mr. ACS Team, Sir. i was wondering. what happen if u guys finnished scanlating aria?? start a new project or continue to stick with what amano sensei make. Amanchu's still in progress, I'm not sure if Mez has anything else planned aside from that. her reaction was so... cute? And what's with her "ring"? There's someone in Alicia's heart? Is the manga different from the anime? After this chapter I think manga is better from that point of view. Anonymous: Remember how the anime ended - and the anime is faithful to the manga. WAI WAI! Thank you ACS! What a coincidence, I just finished reading Mary Hoffman's Stravaganza, and it was about an alternate-world Venice and there was a "Marriage with the Sea" in it.